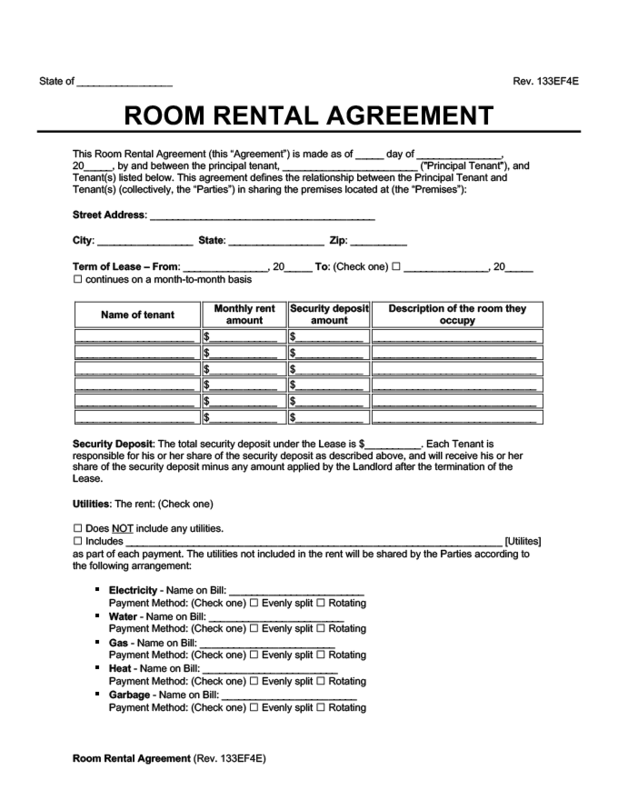 Use our attorney-drafted Room Rental Agreement form when subleasing a room or apartment to clearly outline and define party expectations, duties, and rights. The Basics: What is a Room Rental Agreement? 2. The Basics: What is a Room Rental Agreement? Using a room rental agreement is an effective way to outline expectations of both parties, helping curb and prevent any rental disasters before they happen. A room rental agreement is a legally binding agreement between a tenant wanting to sublease, or rent, their room or apartment to another party. It clearly outlines the expectations and responsibilities of both parties, and upon signing, imposes those specific duties and obligations on them. Room rental agreement is also used interchangeably with the term Sublease Agreement, as it incorporates elements and terms of the original lease agreement, and serves as a detailed and comprehensive guide for tenant responsibilities and rights. Unlike oral agreements, written agreements are usually honored by law, and carry more weight when needing to enforce tenant financial responsibilities and obligations. A room rental agreement is important for protecting tenant rights when entering into a situation where the principal tenant subleases a room or property to secondary tenants. But, how is a room rental agreement different from a roommate agreement? At first glance, there doesn’t seem to be much of a difference between a room rental agreement and roommate agreement. However, there are several notable differences you should acquaint yourself with. When entering into a housing arrangement, make sure you are aware of the differences between the two, otherwise you could open yourself and fellow tenants up to vague and undefined expectations and obligations. Date: the dates the room rental agreement begins and ends. Premises: the address of the premises being leased. Rent: the amount of rent and security deposit to be paid by each tenant. Obligations and duties: each tenant’s basic duties, chores, and obligations under the lease. Utilities: how the utilities will be divided. Specifically, the name of the tenant or tenant’s who will have their names on various utility bills, and how they’ll be paying it. Parking: whether tenants are allowed to park on the premises, and if so, how many vehicles and parking spots are allotted to each. Damages: each tenant’s responsibility for damaged caused by them or their guests, and how damage costs will be shared when the source of the damage cannot be reasonably traced back to a particular tenant. Renter’s insurance: whether the tenant’s will purchase renters’ insurance. Smoking and alcohol use: tenant responsibility for maintaining reasonable standards of behavior and noise when consuming alcohol, designated smoking areas, and any alcohol or tobacco prohibitions. Various permissions: for example, whether pets or guests are allowed. If you aren’t the principal tenant on the lease, and are looking for a simple roommate agreement between you and another roommate, click here and fill out your roommate agreement template in minutes. Room rental agreements are sometimes referred to as ‘Room Lease Agreements” because the new tenant agrees to the terms and conditions of the original lease. The sample room rental agreement below details an agreement between the principal tenant, ‘Ryan Wood’, and two other tenants, ‘Lillian Murphy’ and ‘Bob Hurley’. The three tenants agree to a set of rules regarding how utilities are paid and behavioral stipulations. You should use a room rental agreement when you are a homeowner, principal tenant, or building manager, and want to lease a private room or portion of your property to a secondary tenant. Room rental agreements should be used when you want to clarify expectations, obligations, and responsibilities of both parties, and want to promote a harmonious living environment. Room rental agreements are a great tool to curb potential issues before they escalate, and allow parties to open up communication channels. When entering into a housing agreement, parties often overlook simple and obvious points of future contention, so think of a room rental agreement as a catalyst for starting certain difficult conversations early on. Keep in mind, in the eyes of the law, room rental agreements aren’t all encompassing. Although courts are more likely to enforce financial responsibilities of both tenants, they are not going to order a delinquent tenant to vacuum the living room, or wash the dishes. The party you are renting to has a boyfriend or girlfriend: If you are wary of your roommate or other tenants having their significant others over 24/7, a room rental agreement can help set boundaries for when they are, and are not, allowed. After all, having someone not covered under the lease over all the time can result in increased electricity and other utility bills, or other precarious situations. Your roommate has guests constantly staying over: A room rental agreement is important for keeping your place private, quiet, and undisturbed, allowing you to outline days of the week when roommates can’t throw parties, cause excessive noise, or have uninvited guests. You want to divvy up household expenses and other costs: No one wants to end up being the only roommate washing dishes, or paying for cleaning supplies, while the other sits back and does nothing. Executing a room rental agreement allows parties to determine how household and other important costs are divided. You want to provide for respective property maintenance duties: During winter months, someone will likely have to shovel the driveway, decks, and other community areas. And, in summer, someone will likely have to mow the grass and attend to other general lawn-care duties. The burden for basic maintenance duties shouldn’t fall solely on one party, so make sure to provide for these situations in your agreement. You want to establish quiet hours: Noise complaints are one of the most common causes of concern for roommates and potential tenants. Establishing quiet hours is important for not only a tenant’s comfortability, but their sanity as well. Some housing agreements can be a bit over the top. For instance, Sheldon, from The Big Bang Theory, includes such clauses as “the godzilla clause,” “bodysnatchers clause,” and “skynet clause,” all of which range from destroying monsters to artificial intelligence. When entering into and discussing the terms of a room rental agreement, compromise is always the best answer. Without a room rental agreement, you risk opening yourself and other tenants up to financial liability, stress, and even future litigation. Without a room rental agreement, you risk opening yourself and other tenants up to severe financial consequences and wasted time, both of which lead to serious headache and stress, or even a potential lawsuit. Below is a non-exhaustible list of the preventable suffering a room rental agreement could help prevent and resolve. Lost Money One party may end up stuck paying more rent, forfeiting a security deposit, or paying for damage to the property, because a party moved out early without notice. Lost Time If a roommate departs early, and without notice, you could be tasked with an unexpected search for a replacement roommate. Or, maybe you and your roommate have a disagreement over noise levels after midnight, without an agreement, you risk wasting time sorting these problems out at a later, inconvenient, date. Additionally, you don’t want to be cleaning up after your roommate hosts friends or a party, or from their general uncleanliness. Lost Property Without a room rental agreement, borrowed personal property could be damaged or never returned. Additionally, if community property is damaged during the course of tenancy, one party could be burdened with the bill. Mental Anguish Strained relationships are a common consequence of failing to outline a party’s rights and obligations under a contract. A landlord could distrust you due to your roommate’s behavior or lack of timely rental payments, or even a friendship with your roommate could deteriorate over small misunderstandings. Room rental agreements are effective tools for designating smoking areas, and whether alcohol is permitted on the premises. Does a room rental agreement cover multiple tenants? Yes. A room rental agreement can cover multiple tenants. Be sure to include each tenant’s identifying information, along with the specified dates of their lease, as some tenants and roommates may differ. Can I execute a week-to-week room rental agreement? How about a month to month room rental agreement? Room rental agreements can be executed week to week, or month to month. Make sure when creating your document, you specify the correct dates of the lease.